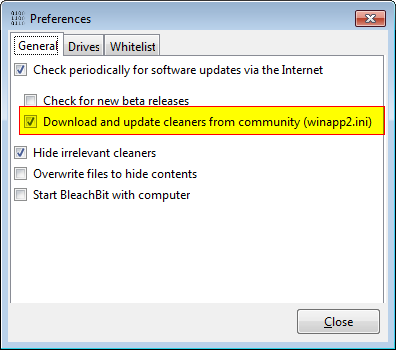 BleachBit version 0.8.7 and later imports cleaning rules from winapp2.ini files giving Windows users 2000+ additional cleaners (and growing) created by the community. Piriform does not endorse importing "CCleaner data" into BleachBit. If you are writing new cleaner definitions, it is recommended you write them in CleanerML instead of winapp2.ini format because CleanerML is cross-platform, not legally encumbered, and contains many features not available in winapp2.ini. First, make sure you are running BleachBit version 0.8.8 or later. Then, check this box, and restart BleachBit to download the winapp2.ini file. Restart BleachBit again for it to take effect. Download a winapp2.ini file. The CCleaner community organically maintains various files: winapp2.ini. This file is not created by endorsed by Piriform, maker of CCleaner. An alternative file Winapp2.ini plus contains additional entries for BleachBit. Place the winapp2.ini file in the right directory, which is most of the same directories as CleanerML. If you install BleachBit (i.e., non-portable mode), below are the recommended directories. See CleanerML storage for more options.